There are three different forms of angina pectoris. These include stable angina, prinzmetal angina and unstable angina. Angina may occur due to inadequate oxygenation of the myocardium. 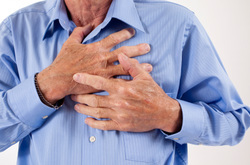 The common symptoms of angina is chest pain. However, angina pectoris may be silent in diabetic patient. Stable angina may present with symptoms and signs such as chest pain associated with exertion that is relieved with resting and the intake of nitroglycerin.Stable angina is associated with atherosclerosis and treated with beta blockers, calcium channel blockers and nitrates. Variant angina is also known as prinzmetal angina which present with episodes of chest pain that occur at rest. Prinzmetal angina may be associated with vasospasm of the coronary artery. Prinzmetal angina is treated with calcium channel blockers and nitrates. ECG may indicates elevation of ST interval. Unstable angina is also known as crescendo angina. Unstable angina present as progressively chest pain that occur with exertion initially which later happen at rest.Unstable angina occur due to thrombosis and atherosclerotic plaque disruption. Unstable angina is treated with revascularization. ECG may also indicates elevation of the ST interval. 1.Yeghiazarians, Yerem, et al. "Unstable angina pectoris." New England Journal of Medicine 342.2 (2000): 101-114. 2.Parker, John D., and John O. Parker. "Nitrate therapy for stable angina pectoris." New England Journal of Medicine 338.8 (1998): 520-531. 3.Marsh, Charles A., Alberto Benchimol, and Kenneth B. Desser. "Variant angina pectoris." JAMA: The Journal of the American Medical Association 235.8 (1976): 833-837.